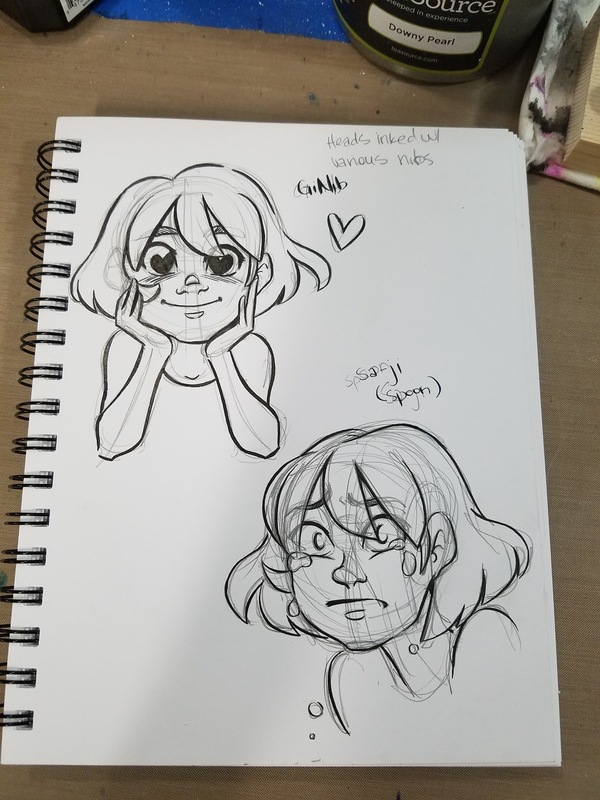 Inktober is right around the corner! To help you guys get ready, I'm working on several resources (video and blog posts) that will demonstrate various inking tools, techniques, and tips to help you get off on the right foot! 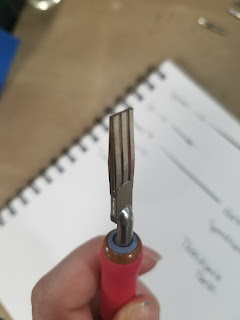 Today we're talking about something most artists have dabbled with, but relatively few use regularly- nibs! In this post, we're going to cover nib types and their uses. Inking with a nib is very much about personal preference. First off, you may not enjoy it at all, preferring brushes, brush pens, or technical pens to nibs. Secondly, you might enjoy the act of inking with a nib, but hate the maintenance that nibs require. Thirdly, you may discover that you prefer some nibs to others, so I recommend you experiment widely. 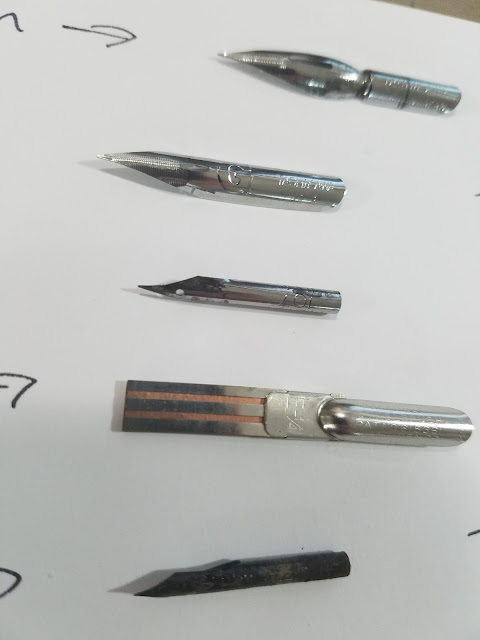 Even amongst nib types, there are certain brands that work better than others. 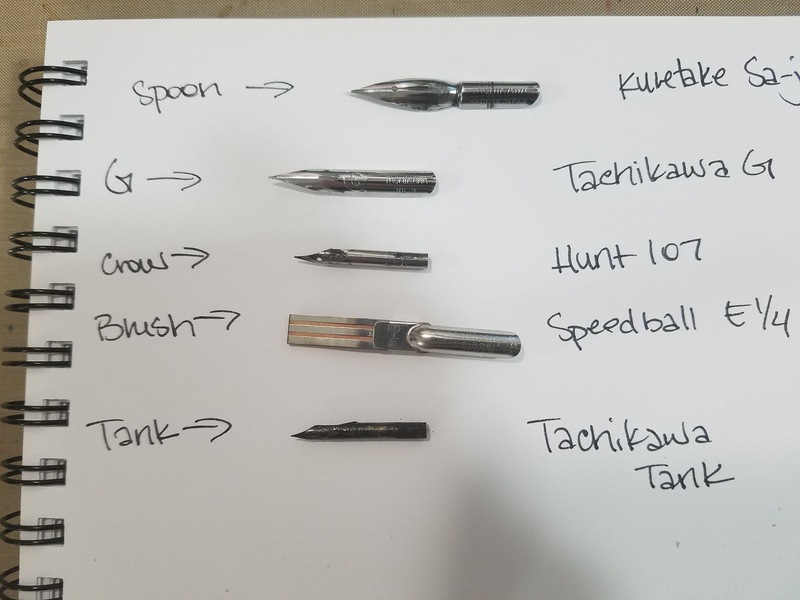 Your flexible nibs can be Western (crowquills, mapping, certain calligraphy nibs) or from Japan (G, Saji, tanks), but what really matters most is your preference towards how your work looks with those nibs. 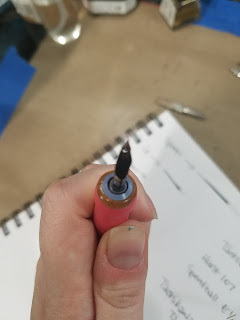 Although flexible, this brush nib is not really flexible in the way we think of flexibility for lineart- it produces a solid single width. 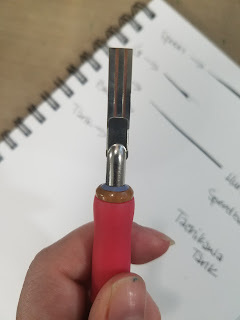 This is more of a border and lettering tool than a tool for inking lineart. Most of these nibs don't hold much ink, so you'll have to dip often or use an ink cage. 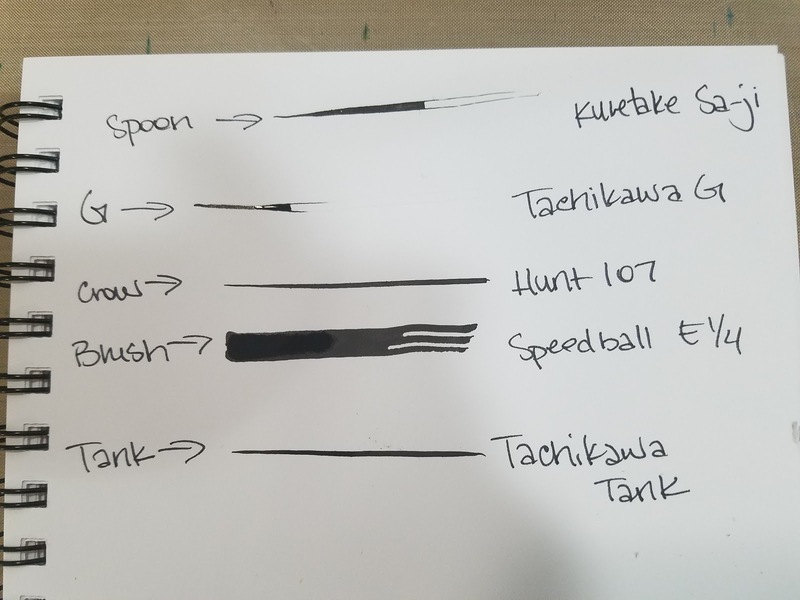 The crowquill nib and the tank nib both hold a fair amount, and may be preferable if you dislike dipping often. A and C are useful for borders, B was my favorite for lettering. I have never had the pleasure of owning any D nibs. 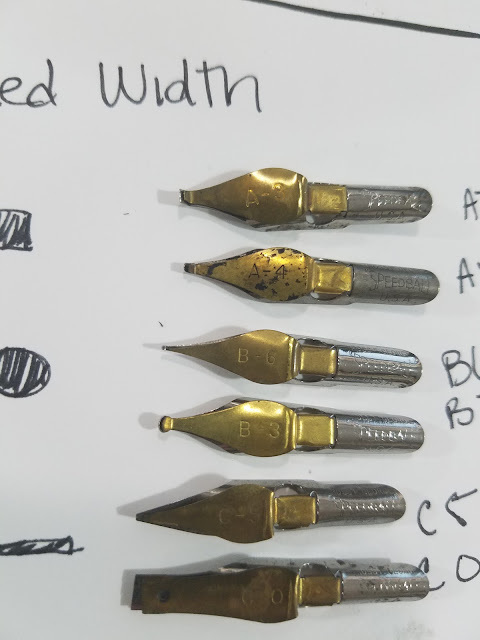 A, B, and C all have different shaped tips. 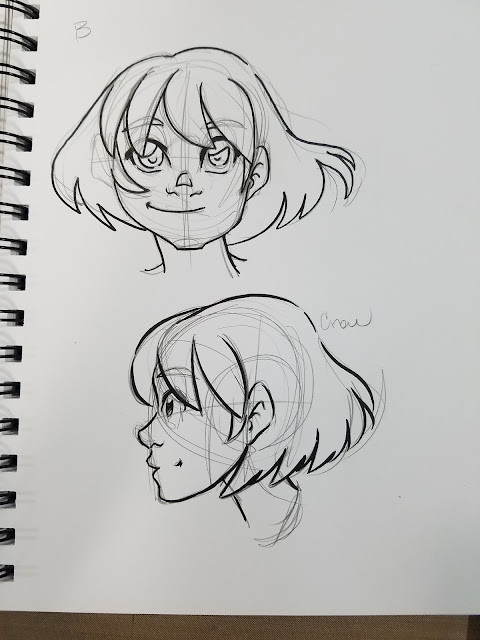 I sketched the basic tip shape for you next to the letter- my preference for inking lineart is B. C may be more useful for calligraphic lettering than for inking lineart. 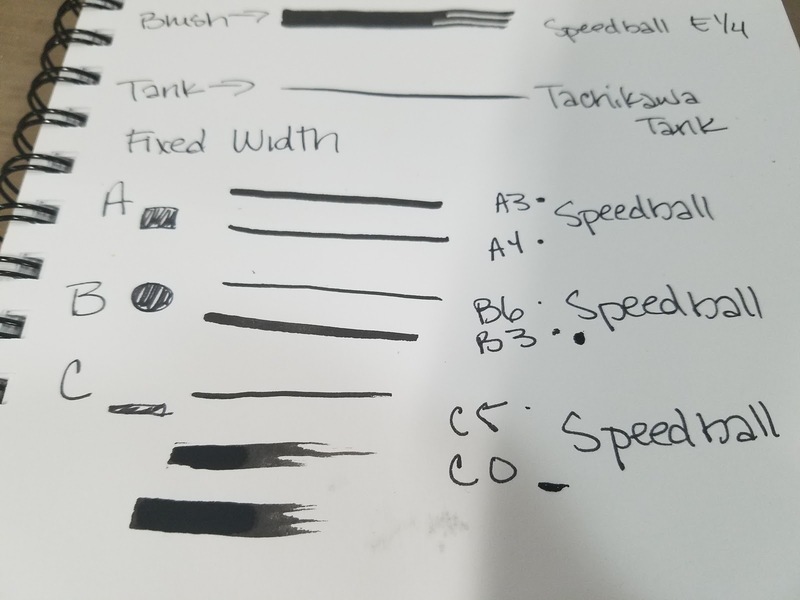 A and C nibs are great for borders on comic pages if you want to go old school, and B is useful for handlettering comic fonts. 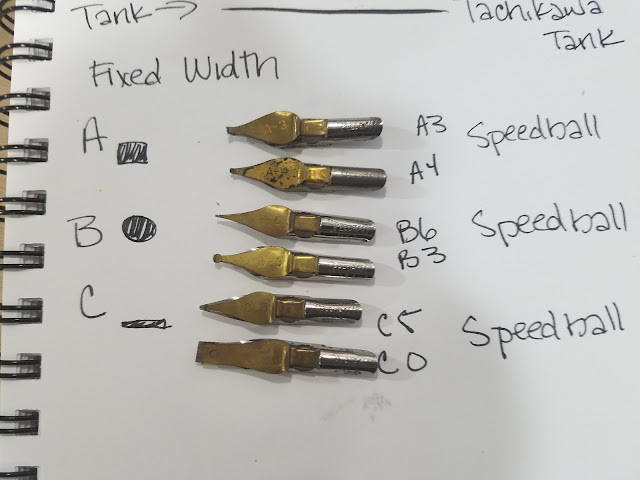 To view these nibs in action, and to hear commentary, please keep an eye on my YouTube channel for this upcoming video demonstration! 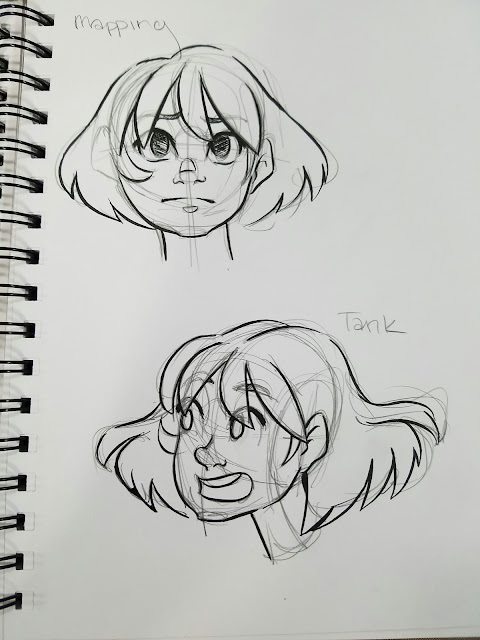 Back when I took Advanced Inking Techniques at SCAD, I wrote several excellent posts to help acquaint others with the materials taught in the class. I highly recommend these older posts. 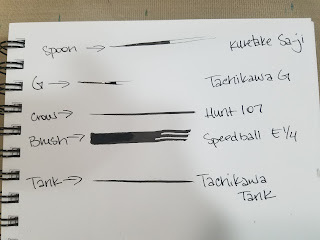 If you enjoyed this post, and want to learn more about inking with a nib, please check out my YouTube channel- I have many videos queued up to help you prep for inking with nibs this Inktober. If you haven't yet, I highly recommend you subscribe for regular updates. If you are an art educator and you use this blog as an educational resource, please let me know! I'd love the opportunity to talk to your class /students via Skype about anything covered on this blog. Email me, and we can also discuss in person visits, if that suites your needs better. And if you enjoyed this post for any reason, please consider helping support future content via our Patreon- a little goes a long way to keeping the blog up and running! You can also help support the blog by sharing this post with your friends and family on social media using the handy buttons below- your good word really means a lot to me! Please consider donating to this blog or purchasing from Natto-shop (http://nattosoup.com/shop) if you want me to continue publishing quality content. All materials tested were purchased from my own pocket. Keep on Truckin' Nattosoup is not under any sponsorship.